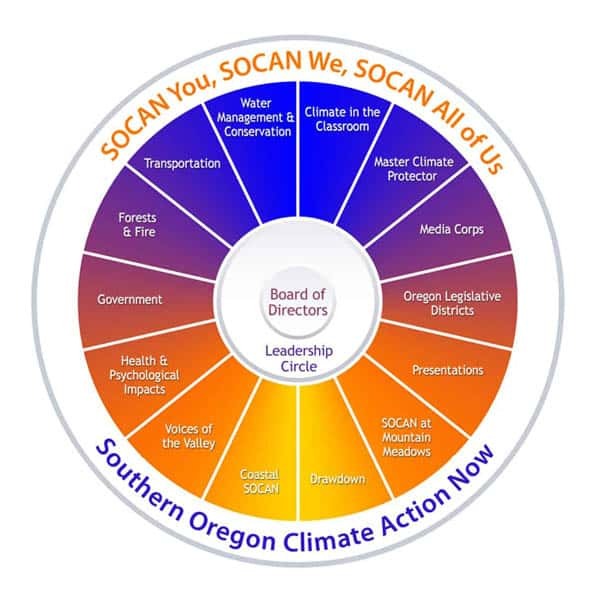 Southern Oregon Climate Action Now (SOCAN) is an all-volunteer grassroots, 501(C)(3) non-profit organization of nearly 1000 Southern Oregon residents and friends who care about global warming; we are concerned about its climate change consequences and the ocean acidification that both result from emissions of greenhouse gases. We have joined forces to address these problems. Recognizing the urgent need for bold action, SOCAN’s mission is to promote awareness and understanding about the causes and consequences of climate change, to develop solutions, and to motivate concerned citizens to take individual and collective action. We seek a reduction in the global atmospheric greenhouse gas concentration to 350 parts per million (Carbon dioxide equivalent: CO2e). To achieve this, we collaborate with individuals and organizations throughout the world and encourage both personal and governmental actions that reduce greenhouse gas emissions. Our 1st meeting was in September 2012 when 70 attendees gathered to brainstorm possible actions and projects. This meeting was organized by the initial steering committee, including co-facilitators Alan Journet and Kathy Conway. The Steering Committee model was changed to a Leadership Circle in June 2013. Following acquisition of Non-profit status, the first Board of Directors was formed and met in December 2014 to approve the by-laws. 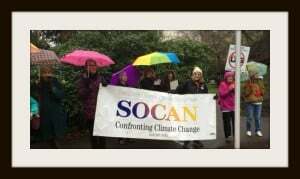 The first BIG SOCAN event, February 2013, “It’s A Rogue Thing: Bringing Climate Concerns Home” (also known as the Salmon event) was organized by a team led by SOCAN volunteers Hannah Sohl, Camila Thorndike, and Louise Shawkat, assisted by many other SOCAN and non-SOCAN volunteers. Presentations, courses, and mini-courses have always been an important Educational component of SOCAN as have information booths at local events. The SOCAN Writing Corps, with some 50 writers, keeps SOCAN and climate concerns in the media. Also, a Resolution supporting state Divestment from Fossil Fuel corporations was passed by Ashland City Council in October, 2014. SOCAN took a giant step in October, 2015 with the Rogue Basin Climate Summit attracting over 250 concerned individuals from across the basin to explore Trends and Projections for the Rogue Basin and develop follow-up projects. In terms of major SOCAN thrusts, Education, that has always been a primary focus of our activities, was affirmed as one of our primary activities. 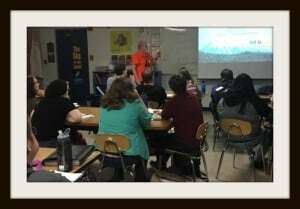 This will involve: educating ourselves and the public about the current scientifically accepted causes, consequences and solutions to climate change; the importance of increasing energy efficiency and conservation and promoting renewable energy; and connecting with students at all levels to inform and inspire them. These will be achieved through courses, programs, and presentations, as well as developing videos and other educational materials. Also recognized as a critical SOCAN component is the array of activities falling under the general category of Collective or Government actions. This focus will be maintained with direct and indirect lobbying for action on climate issues. We hope to inspire, support, advise, and educate representatives and city department/agency staff at all levels to consider and act on climate issues whenever relevant. A third area identified as important to achieving our mission is nurturing partnerships with other groups and entities across the region, state, and nation that exhibit similar missions and goals.